What a day it was in the Big Brother 2014 house on Sunday, as the Backdoor Frankie plan was discussed all day and night and no one truly knew what was going to happen today at the Veto Meeting on Big Brother 16. The Live Feeds on Sunday were the guys (Derrick, Caleb and Cody) deciding if they wanted to get Frankie out this week or keep Nicole as the main target and send her to the jury house again with Victoria as the renom. This decision could be changed at the Veto Meeting, as Caleb’s mind was all over the place with this! So, what did he decide to do? Check out the details below in our Big Brother 2014 spoilers! We had high hopes for today, but Caleb squashed them and even talked to Frankie and told him pretty much everything beforehand. This is lame, but goes with this whole season so far. Knew he wouldn’t do it. Now I hope Frankie gets next HOH and puts Caleb and Derrick up. They wouldn’t make the move let it bite them in the a##!! I knew he wouldn’t either, but don’t give up hope yet, it’s a double eviction this week. Does that mean Frankadell can get his azz kicked twice in one day? Unfortunately this sicko would enjoy it too much. You are so right about that, Mary! We may find out the answer to that question but not before the finale. Yup, that will be the best part of the whole rotten season. Indeed. I hope it’s Derrick, after Frankie of course. Sorry but the only question is how far Derrick can carry Victoria. I think he wants to go to f3 with Frankie and Vic. And he was trying to convince Frankie of that the other night. We’ll see. I don’t think he will make it to F2 with her. Or F3 even. If he does then he will have to do some heavy duty dusting. Cody and Caleb both want her gone. Christine is sitting on the fence. And who the he*l knows what Frankie wants?….other than to be famous of course. But i’m afraid he will have to settle for infamous. what is wrong with all of you? Frankie is and has been playing the game from the minute he walked in the door. He is what keeps me laughing every night on tvgn. This season has been so much better than last year. Christine needs to go and not to the jury house but home to save her marriage. Derrick should win, Donnie should win America’s favorite player and they all should take Victoria to the end if they really want to win since I don’t think any jury member would vote for her to win. But that is my humble opinion. Jewelle, I’m gonna dive in here politely. There are a few people who agree with you. But if you spend a lot of time watching (or reading about) the live feeds, it’s very difficult to watch his antics and enjoy them for the entertainment he hopes to offer. The reason is we’ve all learned what a fake he is, and indeed how cruel he is when the object of his disdain is not around. All of what you see on screen of Frankie is an act. Even if his old fake-English accent around the pool table (which is what I’m seeing for the upmteenth time right now) were still entertaining – which it was in week one – all I see now is the deplorable person who said he would hit Nicole in the mouth if she complained about her third have-not week (second in a row) when Frankie only has had one. So THAT’s what’s wrong with us. Very well said. My reply is in moderation. And it can stay there since you said everything i wanted to say. But nicer. 🙂 I always want people who respectfully make their arguments to feel free to debate them here and not feel ganged-up-on (as I know you do as well). Here’s a suggestion, media mogul Frankie: Use your 97 days in captivity to learn ANOTHER freakin fake accent, eh? Or even better, just close your mouth altogether!! Honestly Lilly, nothing would surprise me this season. You’re probably right. When is someone going to grow some and make a move. They are all sissys in my eyes. Get real this show is so darn boring. Yeah, change that from “Beast Mode” to “Clueless Mode”! Or just put CO in front of MODE and that is where Caleb’s game play is along with the rest of these dumbos! Thank you–I just got home and it only took about 5 seconds to get my mad on! These are the most timid guys I have ever seen and I am beginning to join the “hope Victoria wins” group–it’s what the other deserve. Big surprise. The big wus. Victoria should win if she is in the final two. She had no choice but to float. If she tried to make a move she would be eliminated. Floaters rule! Exactly what I’ve been saying. Indeed. It would serve them all right. Very scripted season. It is obvious that production wants Frankie in the game to the end no matter how it destroys the game. These guys sure do talk a tough self-important game to be such spineless nobodies. These guys are too stupid to see past 5 seconds. The lights are on but nobody is home. I seriously hope this pawn idea backfires on them and Christine can talk Cody and Derrick into keeping Nicole! I would like to see that happen, but I think Christine will vote to evict Nicole. I think it would be in the best interest for Christine game to get them to keep Nicole. If not Christine will follow Nicole in the next eviction, unless she win the HOH. At this point the small happiness I would like to get is seeing Christine get hoh Thursday night. That would through a wrinkle in their plan to send Christine out next! Guess that would seal the deal for Frankie, too! You are right Lilly, I don’t like Christine, but I would rather see her win than Frankie. They should have gotten rid of Frankie when they had a chance. If Frankie win HOH, Caleb and Derrick could be the victim of a backstabbing Frankie. If Christine won HOH they would just convince her to nom Victoria. Take the easy way out and send her to have a talk with Julie. Christine is just like the guys, she talks a big game but is easily manipulated. Wasn’t it Zach and Caleb that convinced her to put Nicole on the block? She had to have 100% assurance before she did it. Just my guess but she would tell whoever sat beside of Victoria that they were a pawn. And don’t forget….it’s Chrisines fondest wish to be the last girl standing. Ousting Victoria would lead to fulfillment of that wish. Not to mention that she would have Codys attention all to herself. You’re right, of course. I don’t believe ANY one of these nutballs will make a move until moves is all they have left. If the comps generally go as Derrick hopes, I think the eviction order goes: Nicole then Christine, then maybe Caleb (because he might get votes for being a “comp beast”), then Cody – with Frankie and Derrick battling in the F3 to determine who takes Victoria to the end. Derrick has already been trying to convince Frankie that taking Victoria to the end is the only sure fire way to win. Knew Caleb wouldn’t have the guts to make a big move. They know they couldn’t beat Nicole if she were to go to the end. Caleb needs to go home next. WIMP! Their ALL wimps. Not one of them can think for themselves. They all need to go home to Mommy. Yeah, they’re all in need of a despair ate diaper change! another LOL to you, Suzanne! Their mommy is already in the house. her name is Derrick. I don’t like Frankie, but I also hope he win the next HOH and nominate Caleb and Derrick. Frankie also win the POV and keep the nominations the same and send Caleb or Derrick packing. What will they have to say for themselves then? Answer: What a knuckle head, Caleb will say to himself when he walk out the door next. If it is Derrick, he will say, I blew 500k. Sad!!!!!! As much as I would hate for that to happen, I agree lol. They have had two chances now to get him out and they refuse, so let him win HoH and take out Derrick! I know right, I can’t believe they are playing like whimps. They don’t have common sense. 500k is on the line here, and you are keeping a strong player in the game and you only have 2 weeks left and 2 people will leave on Thursday. Caleb will be very vulnerable, because he want be able to play in the next HOH. Thanks Todd for the updates. Yep, and Caleb still thinks there is a “Bomb Squad,” right? Yep and may find himself the next casualty, depending on who win the next HOH. 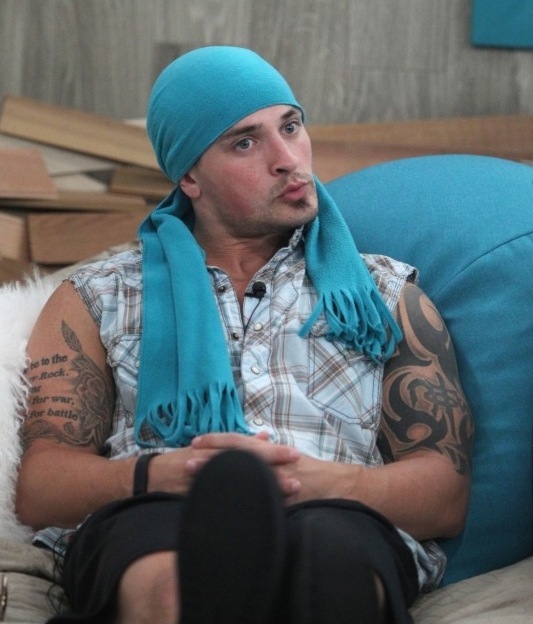 If Frankie win the next HOH he may do Caleb like he did his boy toy Zach. You got that right Ed, because they don’t think for themselves. Caleb is dumber than dirt, No balls or brains! How often does it come down to the fact that the F5 will be so universally hated by the fans? Twice. Last year and now this year. Not a one of them will escape unscathed. They’ve gone from fairly likable to barely tolerable. And the hits just keep on coming with Calebs decision to nom Victoria. It’s like they all are in a coma and going towards the light at the end of the tunnel. They think it’s the spotlight but we know it’s light from this dim bulb of a season. Even a DE doesn’t hold the excitement it should. When I got up today and read who was on the block—I was sick. Some people are just too scared to make a big move and I’m also sick of all votes the same. These HG’s are so lame – no game play – they discuss everything and do a majority vote – where is the bb game play? It’s hiding in the same place as everything else–up in Derrick’s a$$! Sorry for the vulgarity but there are more weenie in this BB house than were cooked on grills today! I don’t think I will either! How true – I like Derricks game play but seriously – the other hg’s have no clue how to or even show game play – this isn’t a puppet show it is bb for money and the winner takes all not runners up / okay maybe 2nd place and Americas favorite (donny) but hello people wake up and smell the coffee – get Frankie OUT I don’t think he deserves a dime nor Victoria. I could not agree more. The only thing good about this season was seeing Donny. Frankie makes me puke every time I see him, Caleb is a weenie, and needs to grow some.Derrick long lost cop you can not trust, Cody well what will he do when Christine is gone, and Victoria she is just a lazy women. I hate this season and I pray TA is gone for good, that was a stupid twist. I hope Donny gets fan favorite. I can’t believe how far Victoria made it without being one of the two final nominees. this was probably Derrick’s doing he knows he could beat Frankie in f2. Beast Mode SISSY!!!!! He and Cody are afraid to make move with out Derek’s approval. The only man in the house is Derek. Nicole is more of man than Caleb. She would have made a bigger move than this one. I hope it bites them in the u know what. and vic and chris win and take out afew of them. So true, Ed! I could not believe how brave he was in nominating Victoria–wow, that sure took lots of courage. He is probably afraid to go to sleep tonight.